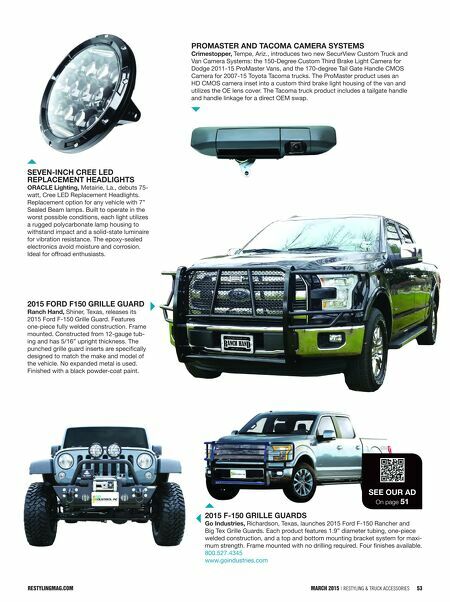 restylingmag.com March 2015 | Restyling & tRuck AccessoRies 53 2015 F-150 Grille Guards Go industries, Richardson, Texas, launches 2015 Ford F-150 Rancher and Big Tex Grille Guards. Each product features 1.9" diameter tubing, one-piece welded construction, and a top and bottom mounting bracket system for maxi- mum strength. Frame mounted with no drilling required. Four finishes available. 800.527.4345 www.goindustries.com 2015 Ford F150 Grille Guard ranch Hand, Shiner, Texas, releases its 2015 Ford F-150 Grille Guard. Features one-piece fully welded construction. Frame mounted. Constructed from 12-gauge tub- ing and has 5/16" upright thickness. The punched grille guard inserts are specifically designed to match the make and model of the vehicle. No expanded metal is used. Finished with a black powder-coat paint. seVeN-iNCH Cree led rePlaCeMeNT HeadliGHTs oraCle lighting, Metairie, La., debuts 75- watt, Cree LED Replacement Headlights. Replacement option for any vehicle with 7" Sealed Beam lamps. Built to operate in the worst possible conditions, each light utilizes a rugged polycarbonate lamp housing to withstand impact and a solid-state luminaire for vibration resistance. The epoxy-sealed electronics avoid moisture and corrosion. Ideal for offroad enthusiasts. 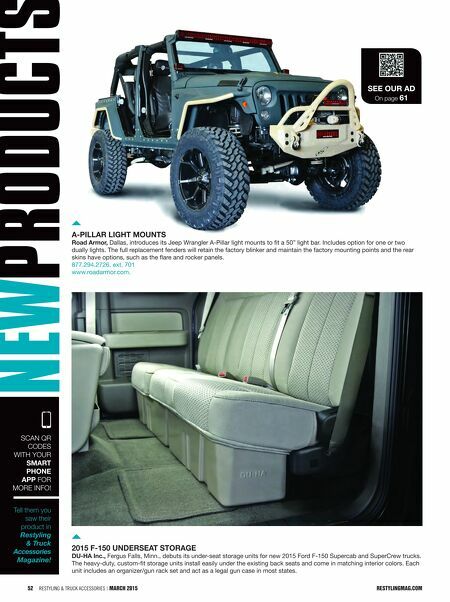 see our ad On page 51 ProMasTer aNd TaCoMa CaMera sysTeMs Crimestopper, Tempe, Ariz., introduces two new SecurView Custom Truck and Van Camera Systems: the 150-Degree Custom Third Brake Light Camera for Dodge 2011-15 ProMaster Vans, and the 170-degree Tail Gate Handle CMOS Camera for 2007-15 Toyota Tacoma trucks. The ProMaster product uses an HD CMOS camera inset into a custom third brake light housing of the van and utilizes the OE lens cover. The Tacoma truck product includes a tailgate handle and handle linkage for a direct OEM swap.